My parents visited this weekend, and while out shopping we stopped by World Market and picked up some Bellagio Sipping Chocolate to try out. The verdict: great. Ever since Starbucks did away with Chantico, we've been looking for a replacement. I'm sorry, but Swiss Miss is icky. I want to drink thick, rich, dark chocolate that's really fattening and bad for you. So we made this stuff with half and half and sipped it out of tiny espresso cups. Delish. Available online here. I finally found the other Chantico drinker! Starbucks broke a little piece of my heart when they got rid of Chantico. I'm going to order some Bellagio Sipping Chocolate today! I gotta take a stand for Swiss Miss - being lactose intolerant - it's one of the few cocoas I can drink without getting ill. Probably because there's really no milk in it. Bad for some - good for me! Oh my goodness - I'm so excited. I also loved Chantico. People would say, "It's the consistency of motor oil," and I always thought - what is wrong with that? I can't wait to try this. Ah! Chantco. My husband and I would always order that and, we too, were sad when they discontinued it! We have organic Green & Blacks over here in Blighty. Do you get it in your part of the world too? They do delicious bars of 70% chocolate but also a hot chocolate powder. I've never been a great fan of hot chocolate but have been completely converted by theirs. Looks Amazingly Sinful! Cant wait to try it! i'm so on my way to world market! i still mourn the loss of chantico, though over the holidays trader joes stocked a sipping chocolate. i bought about five containers and now they are gone! thanks for the tip. thanks for giving me a replacement for Chantico...oh how I've missed it. Wow, so the only seven people in the universe who liked Chantico read my blog. That's amazing. The Bellagio stuff isn't QUITE as good, I think, but I was pretty happy with it. Hope you like it. And I saw that Green & Blacks stuff at Whole Foods right after we stopped at World Market, so I'll have to try that next, after the Bellagio is gone! Oh I never tried it. Now I will have to go get this and see what I have been missing. Oh yes...I must give that a try. Ever since the book and movie "Chocolat" I've envied the steaming hot chocolate they drink. I LOVED Chantico. I felt very french drinking it. I don't drink coffee, so now I have an excuse to get some espresso cups. Yippee! I was shopping today and I saw the Cherry version of Sipping Chocolate! I didn't buy that as I'm not a fan of cherry, but I did find a European Drinking Chocolate by Schokinag at Costco. I cannot wait to dive into it! Ah, this is wonderful stuff. It just so happens that I ran out today and was planning to head over to world market next time I'm near an actual city to retrieve more! Harry and David's has a dark chocolate cocoa mix during the winter, keep an eye out for it! I want to drink thick, rich, dark chocolate that's really fattening and bad for you. I'll have to check it out. I don't know how good chantico was since I have never tasted it. But I sure want to taste some of the sipping chocolate. I am sure my hubby would love it too. Yum. And the color combo on the package is yummy, too. It comes in milk chocolate or dark chocolate. Kimberly and Sansku, thanks for the tips! I love tips! OMFG! Thank you so much for this. Life has just not been the same without Chantico and I have been searching for a replacement ever since (without much luck)! I am going to order some right this minute! yum, i need to get to world market quick!!! i've only been at your website twice. and already a big fan. your site is a breath of fresh air. i feel alive when i see the stuff you post. even the chocolate. i'm going to get that stuff. your parents should be proud! so days when i am down and think so much is wrong with me and my self, i just have to come here. it's a happy place. thank you. And chocolate makes everything better. :) I'm not kidding, either. For me, it's chocolate, coffee, blogging, and Jesus. Not necessarily in that order. I'm glad this blog has a happy vibe. I hope it can encourage people. I think a lot of the reason I write it is to make myself happy, too. 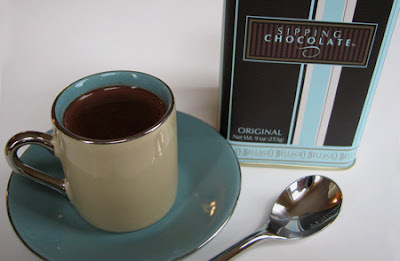 Though I've never had the Sipping Chocolate, I've long been a fan of MarieBelle's hot chocolate mixes. They have a dark, chocolately taste, and the store is adorable. The draw back? I pick up a can whenever I'm in NYC, but otherwise I have to order it online. Pricey, but great for those special occassions like a winter party with friends. I agree - this is my favorite hot cocoa mix. And the ingredients at least seem more natural than most of the stuff out there. Devon, thanks for the tip!